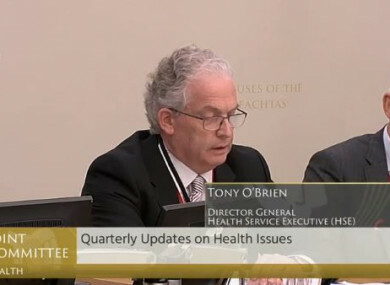 O'Brien at today's Oireachtas Health Committee. HSE BOSS TONY O’Brien has again told politicians that he will not be stepping down from his position. Speaking before the Oireachtas Health Committee, O’Brien said that he “respectfully declines” an invitation that was made by Fianna Fáil’s Stephen Donnelly TD that he resign. O’Brien is leaving the top role with the Health Service Executive in August but has been under increasing pressure to leave early and again today was asked to do so by Donnelly. “Fianna Fáil’s position is we would like to see you step aside with immediate effect, without prejudice. I’m very conscious that as spokesperson I have asked for that publicly in the Dáil and in the media, but not in the position where you’ve had the chance to respond to that,” the Wicklow TD stated. So I’d like to put it to you to give you the chance to respond in open session. I take no joy in the call and I’m very conscious that you’ve given many years of public service to healthcare. In response, O’Brien stated that he would not be standing down and repeated his position that he was not aware of the extent of CervicalCheck problem and the case of Vicky Phelan. “Thank you for the courteous way you’ve addressed the question, I appreciate that. It is correct to say these are significant issues,” O’Brien told the committee. Last week, you heard from all of the other witnesses who were present who indicated that I had not in fact been informed of the circumstances of this case, neither did I know it was coming, in circumstances where it would have been relatively straightforward for them to get themselves off the hook, by saying that they had. I am intending to continue the work that it’s been agreed with the minister that I will do, in order to address all the issues which are of significant concern. I appreciate that you’re suggesting I resign without prejudice. I’m not exactly sure what that really means, but I understand it’s intended to be polite and respectful. “I understand your point, I respectfully decline to accept your invitation to resign without prejudice, or otherwise,” he added. Sinn Féin’s Louise O’Reilly TD then asked O’Brien whether he felt it was acceptable that he was unaware of the CervicalCheck problems given his position within the HSE. “Yes, I thought I had said that last week, that I was not at all happy, for multiple reasons,” O’Brien said. Email “Tony O'Brien again faces politicians and again 'respectfully declines' to step down ”. Feedback on “Tony O'Brien again faces politicians and again 'respectfully declines' to step down ”.